Cardamom gives the aubergine a sweet fragrance, so don't be put off by the quantity of pods used in this delicious dish. Prepare and light the barbecue or preheat the grill to medium. Using a sharp knife, remove the aubergines' leafy tops and cut lengthways into 3-5mm slices. Set aside. Using a pestle and mortar, lightly crush the cardamom pods. Remove and discard the green outer husks, leaving only the black seeds behind (it should produce ½-1 tsp). Crush these lightly. In a large bowl, mix the olive oil, lemon juice and almost all of the chopped parsley together. Add the prepared cardamom seeds, season and mix together well. Now add the aubergine slices and toss in the dressing until evenly coated. Cook the aubergine slices in batches on the barbecue or under the grill for 3 minutes on each side, or until just tender. Keep the aubergine warm while toasting the bread until golden. 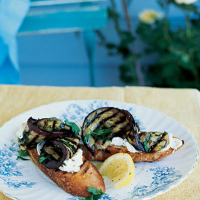 Spread the toast generously with cream cheese then top with the aubergine slices. Drizzle with any remaining dressing or extra olive oil, sprinkle with the remaining parsley and garnish with a lemon wedge. Eat while still warm. Prepare in advance by mixing as described but not cooking. Ensure that the aubergine is well coated in the dressing. Cover and place in the fridge until needed. Season just before cooking. The bread can also be toasted the day before, stored in an airtight container and gently reheated around the edge of the barbecue.